Absolute monarchy in France slowly emerged in the 16th century and became firmly established during the 17th century. Absolute monarchy is a variation of the governmental form of monarchy in which the monarch holds supreme authority and where that authority is not restricted by any written laws, legislature, or customs. 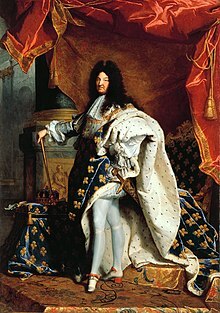 In France, Louis XIV was the most famous exemplar of absolute monarchy, with his court central to French political and cultural life during his reign. The 16th century was strongly influenced by religious conflicts developing out of the establishment of Lutheranism and permanent wars. However, France's critical position turned out to be of a central meaning for the formation and theoretical justification of absolute monarchy. Its disputes between monarchy and community as well as the fatal loss of the House of Valois' authority during the second half of the 16th century prompted nation-state theoretical reflections that led to a strengthening of the monarchic central power, so helped to overcome the monarchy's crisis and to consolidate the internal and external political situation. By the early 9th century, the efficient administration of Charlemagne's Empire was ensured by high-level civil servants, carrying the, then non-hereditary, titles of counts (in charge of a County), marquis (in charge of a March), dukes (military commanders), etc. During the course of the 9th and 10th centuries, continually threatened by Viking invasions, France became a very decentralised state: the nobility's titles and lands became hereditary, and the authority of the king became more religious than secular and thus was less effective and constantly challenged by powerful noblemen. Thus was established feudalism in France. Over time, some of the king's vassals would grow so powerful that they often posed a threat to the king. Since then, French kings had continuously tried to strengthen existing royal powers scattered among their nobles. Philip the Fair, Charles the Wise and Louis the Cunning were instrumental in the transformation of France from a feudal state to a modern country. By the time of Francis I, France was a very centralized state but the French Wars of Religion posed a new threat to royal absolutism with quasi-independent Protestant strongholds developing in various locations in the country. With his skilful Prime Minister Richelieu, who vowed "to make the royal power supreme in France and France supreme in Europe." 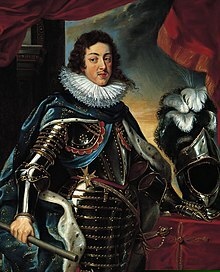 (source: Cardinal Richelieu's Political Testament), Louis XIII established Absolute Monarchy in France during his reign. When his son and successor Louis XIV came to power, a period of trouble known as the Fronde occurred in France, taking advantage of Louis XIV's minority. This rebellion was driven by the great feudal lords and sovereign courts as a reaction to the rise of royal power in France. Lesser nobles, who had the ability to read and write, also acted as the king's agents. Effectively, they were his representatives of government to the people. They collected taxes, posted edicts, and administered justice. The Huguenots, who since the 1598 Edict of Nantes by Henry IV, held the rights to bear arms and to build fortifications in certain locations. A more subtle tactic was the demolition of a number of fortified castles still owned and occupied by members of the nobility. This Edict of 1626 was justified as a budgetary reform to reduce maintenance costs by removing obsolete fortifications within the borders of France. While a rational economic step in itself, this measure did have the additional effect of undermining the independence of the aristocracy. Louis XIV reduced the nobles’ power further by requiring them to spend at least some portion of the year as courtiers in residence at the Palace of Versailles. At Versailles, the aristocracy were removed from their provincial power centers and came under the surveillance and control of the royal government. Rather than seen as demeaning, the nobles took required membership of the royal court to be a high honor. Nobles, being granted residence at Versailles, were generally prepared to give up their former duties as royal representatives outside Paris. Louis XIV, with the help of his minister of finance, Jean-Baptiste Colbert, replaced them with royal appointees drawn largely from the merchant class, who were generally better educated and whose titles were revocable and not hereditary. The final outcome of these acts did centralize the authority of France behind the king. The replacement of government ministers, removal of castles, and other financial policies of Colbert did reduce French national debt considerably. In the 18th century, however, the relocation of nobles and the sheer obsolescence of Versailles became an important place for a rising merchant class and an instigative press. Perhaps the most pressing consequence of absolutism in France is the emigration of the Huguenots. Of the merchant class, their emigration effectively led to a brain drain and a loss of tax revenue for France. Moreover, barred from New France, they immigrated to other nations, most notably the 13 colonies, taking their skills of printing, glass making, carpentry, ceramics, a deep belief in the needs for freedom of religion (at least for Protestantism), and the right to bear arms. The other consequence of the was a large reduction of the dominating influence of the Kingdom France in Europe, and raise the power of other kingdoms to strengthen their empire, notably in Great Britain, Spain, and the Holy Empire. This caused numerous deadly wars with them (in Europe, America and Africa), some of them won by France or its allies (notably for the independence of the United States), but this caused the loss of most part of New France (most continental parts in North America, including those there would be sold later to the United States after the end of monarchy in France by the First French Empire, and some islands in the Caribbean), severe degradation of the economic advantage of the first French colonial Empire, accumulation of debts in the kingdom (with a growing influence of the merchants against the French nobility), and a considerable loss of economic, diplomatic, political and cultural influence in Europe, all these being left to the growing British colonial empire (even after its loss of New England) and to its allies all around France in Spain (including the Spanish Netherlands), the Holy Empire, Austria (including Italy), Nordic countries (and later the United States). Another consequence of the creation of the United States (with the liberal ideas promoted in the Century of Lights coming back to France) and of the costly wars between France and all its neighbours in Europe, was also that it initiated lot of severe political and social troubles throughout the kingdom, and it paved the way to the French Revolution and finally the end of the absolute monarchy, via a short step of constitutional monarchy (restoring some parliamentary powers to the Estates General) between 1789 and 1791, and then to the First French Republic (during which the dictatorial and deadly eviction of the traditional French clergy and nobility from the new Constitution further further strengthened the military alliance of all European neighbours against France). That lost influence of France was never restored in the following centuries, even after the emergence of the First French Empire (which terminated the dictature, reunited a strongly divided France, restored the freedom of religion, and allowed the reemergence of a stable commercial sector, but also initiated new wars against other monarchies in continental Europe), or after the formation of a new French colonial empire (mostly in Africa and Asia) by the Third Republic. At the same time, the United States challenged the stability and influence of France which did not respect the former alliance of the Kingdom of France (and later the First French Empire): the first three French Republics failed to respect the basic rights (that their constitutions were supposed to protect as a fundamental law applied to their governments), while the United States influenced the evolution of other European monarchies to adopt a more liberal system of government, some of them evolving to a constitutional monarchy or enforcing another balance of powers like in Britain. The three first French republics were for long not considered by the United States as a strong ally and a stable model for the development and protection of democracy and freedom, until the early 20th century during the Russian revolution (but the third French republic also failed to avoid the dictature during World War II): a republican form of government was not a sufficient protection against absolutism and dictatures. On the opposite, most other European monarchies evolved to very liberal, balanced (and non absolutist) systems of government, kept even if many of them later evolved to republics, or when they restored a constitutional monarchy (after some dictatorial republican government). Even today's Fifth Republic in France mimics some models from other European constitutional monarchies, because of the stability and influence of the head of state (monarch or elected president) to preserve the territorial unity by an enforced balance of powers (not separated territorially but by domain of government). Unlike past republics, it even accepts and protects constitutionally the presence of nobility, religions or diverse cultures, as plain components and (non absolute) actors of the republic, even if it promotes (without enforcing it completely in all domains) its own unified system, freely accessible to all its nationals or applicable directly only to its foreign residents. Most forms of absolutism (in monarchies, or in republican, imperial or military dictatures that have brutally followed them, like it occurred in France or Russia, or later in Germany, and in Africa, South America or Asia) have rapidly failed to unify and develop a country with its people; instead, it initiated various forms of nationalism and ethnic or cultural divisions (sometimes with deadly civil conflicts), frequently followed by territorial splits (initially de facto, but later recognized as plain independences), or followed by military invasions, annexions or occupations by neighbouring countries, also often with forced and massive migrations of people, with major difficulties (during several generations) to restore an internal stability and a significant economic, political and cultural external influence for the newer regimes. ^ "Sixteenth Century". Lepg.org. Retrieved 2012-10-19. ^ "France History, The French Valois Dynasty 1358-1589". Bonjourlafrance.com. Retrieved 2012-10-19.